Guinness beer: a healthy brew? Guinness. That enticing black beer from Ireland. A full-bodied Irish stout, complete with thick creamy head. Just lovely. And it seems that, whatever calories the beer contains, the old advertising slogan "Guinness is good for you" may even have some truth to it. While there is no significant nutrition or food value provided by the beer beyond some carbs and protein, apparently researchers have recently found that, in contrast with lager beer such as Budweiser, Heineken or Coors, light drinking of the black stuff can be of some benefit to heart patients. The brewery doesn't now claim any food or health benefits for its product, but the research did find light anti-arterial clotting properties in the beer. That's probably its only nutritional claim to fame, though. 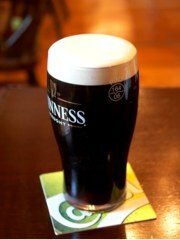 Guinness stout has been brewed since the mid-18th century when old Arthur opened his Dublin brewing plant. There are several breweries around the world now, including one in Canada. Modern innovations such as nitrogen injection for serving the draught version of the beer now account for some of the smoothness and creaminess we have come to associate with it. And it looks beautiful. And it's full of flavor. Drool. The dark color - look through your glass carefully in good light to see it's actually a deep red - comes from the use of roasted barley in the beer's recipe ingredients. In style, the opposite end of the brewing spectrum to a typical lager. Oh, you want to know the number of calories in Guinness? At a typical 17.6 grams of carbs and about 1 gram of protein per bottle (which is as far as its nutrition goes), it's not a light beer by any means, so you won't lose weight by drinking it! According to information supplied by the brewery, there are 35.2 calories in Guinness Draught (or "Draft") beer per 100ml serving. That means that a pint has just short of 200. No, sorry, we can't justify adding it to the list of recommended daily foods for any type of diet. While its carbs are similar to those of other beers of around the same alcohol level, Guinness's calorie content, though, is clearly lower than that of many beers of similar strength such as pale ale. For example, a typical lager beer like Coors or Heineken may contain around 240 or more calories per pint. The current version of the beer is not as strong as that sold in the 19th century and before, otherwise the count would be much higher, but no-one today would think of this dark drink as a diet or light beer. There is a good 20% more calorie content in Extra Stout, which is closer to the original strength and similarly more alcoholic per serving than Draught (and contains correspondingly more protein). A 12-ounce bottle of Extra Stout has a nominal 153 calories. Guinness... mmm. OK, that's it. Opening one right now.